Kait lives a stubborn life on land. 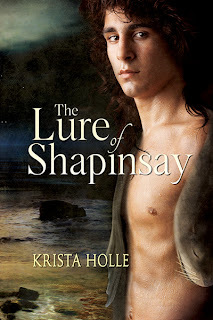 Her brother tries to marry her off to a man she doesn’t want and to top it all off, she has a vengeful selkie after her. While trying to prove her innocence to the selkie man, she’s captivated by his ethereal beauty. She knows his lure could be her death, but she’ll do anything to keep him. The Lure of Shapinsay completely blew me away. Kait and Eamon are prime examples of two people in love who’d do anything for each other and Krista Holle certainly gives them life, making them feel real. They struggled with making their relationship work as they were from two completely different worlds. This lovely romance took an already impossible situation, Kait and Eamon’s unusual mutual attraction, and formed a lesson about love. Love doesn’t always happen as expected, but when it does happen what would you do? Would you fight for a forever kind of love, like Kait and Eamon’s? Reading about selkie folklore is still quite new for me. I’ve read a couple of stories but none delved as deep into their mystery. There was never any misunderstanding of Eamon’s actions, like his rash adventures on the island, because they were explained through facts about the selkie woven into the story. The historical element was a perfect backdrop of Kait and Eamon’s story. Their way of life and even their language was different, but it caused their claims of love and devotion to come across as even more romantic. The Lure is a paranormal romance promising heartfelt emotions and determined lovers. With astonishing twists and turns The Lure of Shapinsay will lure you in from page one and keep you until you drown in contentment.